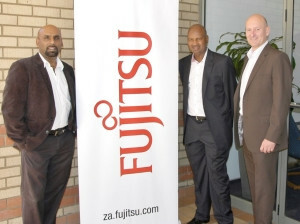 (From left to right) Puven Ramasamy, Fannie Mahlangu and Quentin Schots - Equity partners in Fujitsu's B-BBEE Deal. Fujitsu today announced that the company has concluded an equity transaction with Thuthukani Investment Consortium (TIC), reinforcing Fujitsu's commitment to South Africa and to the principles of broad-based black economic empowerment (BBBEE). Fujitsu sold an equity stake to TIC, reaffirming Fujitsu's confidence in South Africa and in the opportunities on the African continent. TIC has purchased 25% plus one share in Fujitsu Services Infrastructure Holdings (FSIH), the South African subsidiary of Fujitsu Technology Solutions (Holding) BV. TIC comprises Amava Holdings and Thuthukani Information Technology Services, each of which own 45% of the shares in TIC. The remaining 10% is held in a BBBEE trust. The transaction supports the South African Department of Trade and Industry's strategy and policy to advance economic transformation, and it will bring a transfer of skills and expertise to the consortium member businesses. Fujitsu stands to gain increased exposure to public sector business opportunities, particularly as people from historically disadvantaged communities will share in the benefits of such opportunities. Fujitsu already has made significant progress in advancing economic transformation in South Africa, as recognised by the company's recent BBBEE Level 4 rating. The BBBEE rating system provides clear, measurable outcomes in ensuring a path for all South Africans to greater broad-based and effective economic participation, the right to equality, increased employment, more equitable income distribution, the nation's economic unity, equal opportunity and access to services, and protection of the common marketplace. Fujitsu has set a target of achieving a Level 2 rating and is progressing steadily towards this goal. "It is extremely important for corporate entities to play a role in the advancement of economic transformation in South Africa, particularly as this will contribute to a more vibrant, more competitive economy. At Fujitsu, we take this issue seriously and we welcome the confidence that TIC has in us and we look forward to developing our relationship through mutually beneficial projects." "We already have enjoyed a successful relationship with Fujitsu since the announcement of our initial investment in Fujitsu Technology Solutions in 2008. We are confident in the future of the business, and are pleased to be able to extend our investment into the broader, merged Fujitsu operation. It is indeed encouraging to see Fujitsu further entrenching their commitment to South Africa at this time of negative investor sentiment." "This transaction cements our relationship with Fujitsu and strengthens our focus on the IT sector. I am confident the Fujitsu portfolio of services and solutions will complement many of our investments within the IT sector. Fujitsu is not only innovative in their solution portfolio, but they are also showing innovation in the manner in which they are engaging with - and investing in - South Africa." For regular news updates, bookmark the Fujitsu newsroom: http://ts.fujitsu.com/ps2/nr/index.aspx. Thuthukani Information Technology Services is a 100% black-owned and -managed IT company that was established in 1998. It further owns 35% of the Atio Corporation, a call centre and communications company with operations in South Africa, the United Kingdom and other African countries. Amava Holdings is a 100% black-empowered company with a key focus on the IT sector in Africa including South Africa. Fujitsu is the leading Japanese information and communication technology (ICT) company offering a full range of technology products, solutions and services. Over 170 000 Fujitsu people support customers in more than 100 countries. It uses its experience and the power of ICT to shape the future of society with its customers. Fujitsu (TSE: 6702) reported consolidated revenues of yen4.5 trillion ($54 billion) for the fiscal year ended 31 March 2012. For more information, please see http://www.fujitsu.com.